Organic reactions can often be classified into two broad categories: substitution and elimination. Substitution reactions substitute one substituent for another. Elimination reactions typically form after the wholesale removal of a substituent, with no replacement. 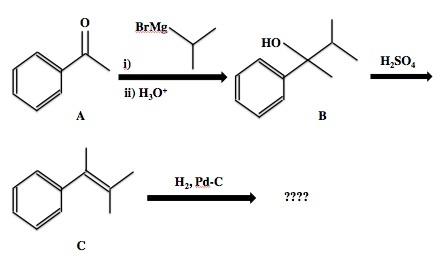 Below are examples of two types of reactions. Which statement accurately describes the chirality of the compounds in the depicted reactions? A chiral carbon is bound to four different substituents; none of the carbon atoms in the passage have this property. There is an inversion of stereochemistry in reaction 1, but it is largely irrelevant because the carbon is not chiral. Compounds that are mirror images of each other are called __________. Stereoisomers are isomers that differ in the orientation of atoms in space, but have the same bonding patterns and structures. Enantiomers are a specific class of stereoisomers that differ in orientation around a chiral center to create mirror image molecules. Diastereomers are a type of stereoisomer that are not related through a reflection operation, and may differ at more than one chiral center. Conformers have the same structural formula, but different shapes due to bond rotation. Carbohydrates can be classified as either aldoses or ketoses. Glucose is an example of an aldose. How many chiral centers are present in a molecule of linear glucose (C6H12O6)? Glucose is formed by a chain of six carbons. Carbon 1 participates in the aldehyde functional group, and cannot be chiral due to its double bond with oxygen. The following four carbons, carbons 2-5, are bound to a hydrogen, a hydroxy group, and two R chains, extending toward carbon 1 and toward carbon 6, respectively. These four carbons each have four different constituents, making them chiral centers. Carbon 6 is bound to the rest of the molecule, two hydrogens, and a hydroxy group; because it is bound to two hydrogens, it cannot be chiral. In glucose, carbons 1 and 6 are achiral, while carbons 2, 3, 4, and 5 are chiral centers. Which of the following differences would never describe isomers? Isomers are molecules that have the same molecular formula, but are different overall compounds due to molecular organization and/or orientation. As a result, isomers will always have the same molar mass. Constitutional isomers will have the same molecular formula, but different binding patterns, resulting in different absolute configurations and often different chemical properties, such as boiling point. Enantiomers are a special class of stereoisomers that will rotate plane-polarized light. A molecule has three chiral centers. How many stereoisomers of this compound will have different boiling points compared to the original molecule? The first step is to determine how many stereoisomers there are for this molecule. Since the number of stereoisomers is dependent on the number of chiral carbons, we can solve according to the equation , where is the number of chiral centers. Since there are three chiral centers, we determine that there are eight stereoisomers for this molecule. Keep in mind that this number includes the original molecule. Next, we need to compare the different stereoisomers to the original molecule. The original molecule will have one enantiomer and six diastereomers. Remember that enantiomers have the same physical properties, so we will not include this isomer in the final answer. Diastereomers, on the other hand, have different physical properties compared to the original molecule. As a result, six stereoisomers will have different boiling points compared to the original molecule. Compounds A and B are __________. Both molecules contain only one stereocenter, bound to the alcohol, methyl, hydrogen, and a carbon chain. Since this stereocenter is inverted between the two molecules, they are enantiomers. The cyclopentyl carbon to which the methyl group and sidechain are attached is not a stereocenter, because it contains a plane of symmetry within the ring. Remember that enantiomers are mirror images, and differ in stereochemistry at only one stereocenter. Diastereomers differ in stereochemistry at multiple stereocenters. Meso compounds are identical. Structural isomers, unlike stereoisomers, have different bonding patters for the same molecular formula. Which of the following methods is best for separating two enantiomers? Treating enantiomers with a chiral molecule, however, would result in two diastereomers, which would have different physical properties and could be readily separated. The molecules shown below are best described as __________. The molecules in this problem are isomers because they each have unique configurations and do not share the same funcitonal groups at the same carbon positions. Enantiomers are reflections of each other. Diastereomers are stereoisomers that differ at one or more stereocenters, while epimers are stereoisomers that differ at only one stereocenter. What reagent(s) will successfully complete the synthesis reaction shown above? This is an example of a Grignard reagent reaction. Because we are adding three carbons to our chain, the Grignard reagent we need must have three carbons on it. We can therefore rule out methyl grignard and ethyl grignard. N-propyl is the straight-chained 3-carbon alkane, while isopropyl is branched. Looking at our final product, we can see the carbon chain we have added is straight-chained, and thus N-propyl Grignard is the best option. Because Grignard reagents are relatively basic, we must add an hydronium ion workup to protonate our alcohol. How many stereoisomers would be obtained by the hydrogenation of compound C? The hydrogenation of compound C would add two hydrogen atoms across the double bond, but would generate only one new stereocenter. This stereocenter would be found on the third carbon in the chain (from the right), which would be bound to the phenyl substituent, a methyl group, a hydrogen atom, and the remaining branched carbon chain. The hydrogenation reaction would create a racemic mixture of both possible orientations of this stereocenter, with both enantiomers present in equal amounts. There would this be two stereoisomer products obtained from the hydrogenation of compound C.
Cornell University, Bachelor of Science, Human Biology. Albert Einstein College of Medicine, Doctor of Medicine, Human Biology.